Hydrogen peroxide (H2O2) has been shown to act as a second messenger that activates chemokine expression. In the present study, we investigated the mechanisms underlying this cellular regulation in the murine macrophage cell line B10R. 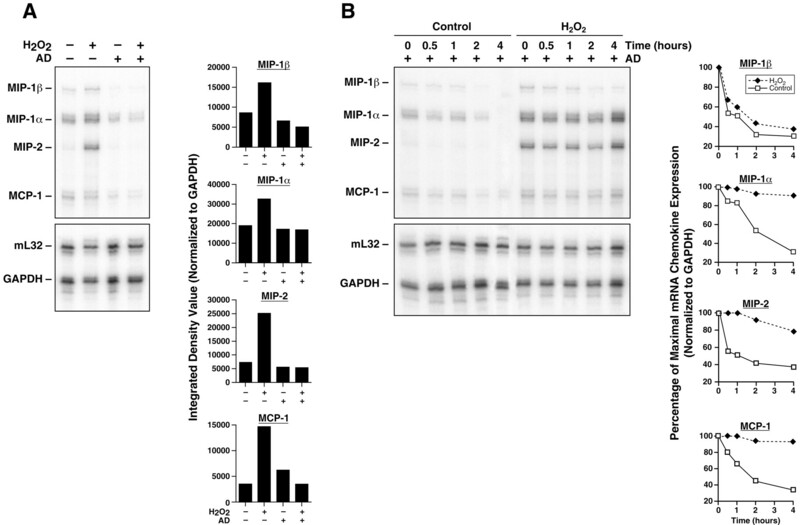 We report that H2O2 increases mRNA expression of various chemokines, macrophage-inflammatory protein (MIP)-1α/CC chemokine ligand (CCL)3, MIP-1β/CCL4, MIP-2/CXC chemokine ligand 2, and monocyte chemoattractant protein-1/CCL2, by activating the extracellular signal-regulated kinase (ERK) pathway and the nuclear translocation of the transcription factors NF-κB, AP-1, and CREB. Blockage of the ERK pathway with specific inhibitors against mitogen-activated protein kinase kinase 1/2 and ERK1/ERK2 completely abolished both the H2O2-mediated chemokine up-regulation and the activation of all NF studied. Similarly, selective inhibition of cAMP and NF-κB strongly down-regulated the induction of all chemokine transcripts as well as CREB and NF-κB activation, respectively. Of interest, we detected a significant decrease of NF-κB, AP-1, and CREB DNA binding activities by reciprocal competition for these binding sites when either specific cold oligonucleotides (NF-κB, AP-1, and CREB) or Abs against various transcription factor subunits (p50, p65, c-Fos, Jun B, c-Jun, and CREB-1) were added. These findings indicate that cooperation between ERK- and cAMP-dependent pathways seems to be required to achieve the formation of an essential transcriptional factor complex for maximal H2O2-dependent chemokine modulation. Finally, experiments performed with actinomycin D suggest that H2O2-mediated MIP-1β mRNA up-regulation results from transcriptional control, whereas that of MIP-1α, MIP-2, and monocyte chemoattractant protein-1 is due to both gene transcription activation and mRNA posttranscriptional stabilization. Hydrogen peroxide (H2O2), a reactive oxygen species (ROS)3, is an agent commonly produced during the oxidative stress generated in phagocytic cells as a defense mechanism against pathogen invasion (e.g., Leishmania donovani) (1). Moreover, H2O2, along with other ROS such as the superoxide anion (O2−), is generated during a variety of inflammatory conditions (2). In these cases, oxidative stress not only contributes directly to tissue damage but can also amplify inflammation by stimulating leukocyte recruitment through local chemokine induction (3, 4). The direct contribution of H2O2 to the inflammatory response has been demonstrated in vivo by showing that its inhibition, and not that of O2−, decreases glucan-induced chemokine secretion and granuloma size formation in rats (5). These results suggest that H2O2 could be responsible for local chemokine expression and the development of inflammation. This in vivo evidence is further supported by numerous in vitro studies, which show the capacity of H2O2 to modulate chemokine expression in a variety of cell types. This cellular regulation includes the induction of IL-8 and monocyte chemoattractant protein (MCP)-1/CC chemokine ligand (CCL)2 in human epithelial (6), synovial (7), and endothelial cells (5), as well as that of macrophage (Mφ)-inflammatory protein (MIP)-1α/CCL3 (8) and MIP-2/CXC chemokine ligand 2 (3, 9) in rat alveolar Mφ. Recently, the concept of H2O2-induced tissue injury has been revised with the appreciation that this molecule can act as second messenger for signal transduction and thus affect proinflammatory gene expression. It has been demonstrated that H2O2 has the ability to inhibit protein tyrosine phosphatase activity (10). Furthermore, substantial evidence indicates that H2O2 leads to the activation of various serine-threonine and tyrosine protein kinases including protein kinase C (PKC) (11), as well as the mitogen-activated protein kinases (MAPK) extracellular signal-regulated kinases (ERK) 1 and 2, p38, and c-Jun amino-terminal kinase (12). However, only H2O2-induced PKC activation has been associated with chemokine expression (13). In addition to its kinase-activating role, several studies show that H2O2 directly regulates the activity of various transcription factors, including CREB in astrocytes (14) and glial cells (15), as well as the reduction-oxidation (redox)-sensitive transcription factors NF-κB (16, 17) and AP-1 (18, 19) in a variety of cell types. Of interest, activation of AP-1 and NF-κB transcription factors has been associated with ROS-dependent chemokine induction. In vivo, the activation patterns of AP-1 and NF-κB were found to correlate temporally with an increase in pulmonary MCP-1 levels in response to oxidative stress (20). In vitro, MCP-1 gene expression was shown to involve H2O2-induced AP-1 activity in endothelial cells, (21); IL-8 mRNA increase was linked to H2O2-dependent binding of AP-1 to the IL-8 promoter in epithelial cells (22) and transcriptional regulation of MIP-2 by H2O2 was associated with NF-κB binding activity to the MIP-2 promoter in Mφ (9). Although this redox regulation appears to occur at the transcriptional level and to be cell-type specific (18), the exact molecular mechanisms involved are largely unknown. In the present study, we were interested in elucidating the transcriptional and posttranscriptional mechanisms whereby H2O2 mediates chemokine expression in murine Mφ, a cell type that appears to be a potential source of chemokines in response to oxidative stress (3). We demonstrate that H2O2 increases mRNA levels of several chemokines (MIP-1α, MIP-1β, MIP-2, and MCP-1), activates the ERK pathway, and enhances DNA binding activity of various transcription factors (NF-κB, AP-1, and CREB). Taken together, our results allow us to propose a multistep, multifactor model for H2O2-dependent chemokine regulation in Mφ, which involves protein kinase activity, NF complex assembly, as well as chemokine gene transcription activation and mRNA transcript stability. H2O2 (3% v/v) and actinomycin D were purchased from Sigma-Aldrich (St. Louis, MO). Isotopes [α-32P]dUTP (3000 Ci/mmol) and [γ-32P]dATP (3000 Ci/mmol) were obtained from ICN Pharmaceuticals (Montreal, Quebec, Canada). Specific inhibitors BAY 11-7082 and MDL-12,330A hydrochloride were purchased from Biomol Research Laboratories (Plymouth Meeting, PA). Apigenin and PD 98059 were obtained from Calbiochem (San Diego, CA). The murine Mφ cell line B10R, derived from the bone marrow of B10A.Bcgr (B10R) mice (23), was kindly provided by Dr. D. Radzioch (McGill University, Montreal, Canada). Cells were maintained in DMEM (Life Technologies, Rockville, MD) supplemented with 10% heat-inactivated FBS (HyClone Laboratories, Logan, UT) plus 100 μg/ml streptomycin and 2 mM l-glutamine at 37°C and 5% CO2. mRNA expression studies were performed using an RPA kit (Riboquant; BD PharMingen, San Diego, CA), as we previously described (24). Total RNA was isolated from stimulated cells with TRIzol reagent (Life Technologies) according to the manufacturer’s protocol. Multiprobe mCK-5, which contains templates for the murine chemokines RANTES, MIP-1α, MIP-1β, MIP-2, IFN-γ-inducible protein 10, MCP-1, and T cell activation gene 3, and the housekeeping genes ml-32 and GAPDH, was labeled with [α-32P]dUTP using T7 RNA polymerase. Labeled probe (3 × 105 cpm) was allowed to hybridize with 10 μg of total RNA for 16 h at 56°C. mRNA probe hybrids were treated with RNase A, and extracted with phenol-chloroform. Protected hybrids were resolved on a 5% denaturing polyacrylamide sequencing gel and exposed to radiographic film overnight at −80°C. Laser densitometry was performed using an Alpha Imager 2000 digital imaging and analysis system (Alpha Innotech, San Leandro, CA). Cell stimulation was terminated by the addition of ice-cold PBS, and nuclear extracts were prepared according to the microscale preparation protocol (25). In brief, sedimented cells were resuspended in 400 μl of cold buffer A (10 mM HEPES (pH 7.9), 10 mM KCl, 1.0 mM DTT, and 0.5 mM PMSF). After 15 min on ice, 25 μl of 10% igepal (v/v) (Sigma-Aldrich) were added, and the lysate was vortexed for 10 s and centrifuged for 30 s at 12,000 × g. The supernatant was discarded and the cell pellet was resuspended in 100 μl of cold buffer B (20 mM HEPES (pH 7.9), 0.4 M NaCl, 1 mM EDTA, 1 mM EGTA, 1 mM DTT, and 1 mM PMSF). Cells were then rocked vigorously at 4°C for 15 min. Cellular debris was removed by centrifugation at 12,000 × g for 5 min at 4°C, and the supernatant was stored at −80°C until used. EMSA was performed using 6 μg of nuclear extract. Protein concentrations were determined using the commercial BCA Protein Assay Reagent (Pierce, Rockford, IL). Nuclear extracts were incubated for 20 min at room temperature in 1.0 μl of binding buffer (100 mM HEPES (pH 7.9), 40% glycerol, 10% Ficoll, 250 mM KCl, 10 mM DTT, 5 mM EDTA, and 250 mM NaCl), 2 μg of poly(dI-dC) and 10 μg of nuclease-free BSA (fraction V; Sigma-Aldrich) containing 1.0 ng of radiolabeled dsDNA oligonucleotide. dsDNA (100 ng) was end-labeled using [γ-32P]dATP and T4 polynucleotide kinase (New England Biolabs, Beverly, MA). This mixture was incubated for 20 min at room temperature, and the reaction was stopped using 5 μl of 0.2 M EDTA. The labeled oligonucleotide was extracted with phenol/chloroform and passed through a G-50 spin column. The dsDNA oligonucleotides (Santa Cruz Biotechnology, Santa Cruz, CA), used as either probes or competitors, were as follows: consensus binding site for AP-1 c-Jun homodimer and Jun/Fos heterodimeric complexes, 5′-CGCTTGATGACTCAGCCGGAA-3′; consensus binding site for CREB of the CREB/activating transcription factor family, 5′-GAGATTGCCTGACGTCAGAGAGCTAG-3′; consensus binding site for NF-κB/c-Rel homodimeric and heterodimeric complexes, 5′-AGTTGAGGGGACTTTCCCAGGC-3′; and consensus binding site for Sp1, 5′-ATTCGATCGGGGCGGGGCGAGC-3′. The oligonucleotides containing NF-κB or CREB binding sites of the murine chemokine promoters were synthesized in our laboratory as follows: NF-κB/MIP-1α 5′-GTGCTTAAAATTTTCCCTCCTCAC-3′ (26), NF-κB/MIP-2 5′-GAGCTCAGGGAATTTCCCTGGTCC-3′ (27), NF-κB/MCP-1 5′-AAGGGTCTGGGAACTTCCAATACTGC-3′ (28), and CREB/MIP-β 5′-CTCGATGCCATGACATCATCTTTAC-3′ (29). DNA-protein complexes were resolved from free-labeled DNA by electrophoresis in native 4% (w/v) polyacrylamide gels containing 50 mM Tris-HCl (pH 8.5), 200 mM glycine, and 1 mM EDTA. The gels were subsequently dried and autoradiographed. Cold competitor assays were conducted by adding a 100-fold molar excess of homologous unlabeled oligonucleotides of the various labeled dsDNA probes. Supershift assays were performed by preincubation of nuclear extracts with 2 μg of polyclonal Abs against p65 (Rel A), p50, c-Fos, Jun B, c-Jun, CREB-1, or Sp1 obtained from Santa Cruz Biotechnology, in the presence of all components of the binding reaction described above for 1 h at 4°C. Cells were collected following stimulation and lysed in cold buffer containing 20 mM Tris-HCl (pH 8.0), 0.14 M NaCl, 10% glycerol (v/v), 1% igepal (v/v), 25 μM nitrophenyl guanidinobenzoate, 10 μM NaF, 1 mM sodium orthovanadate (Vi), and 25 μg/ml leupeptin and aprotinin. The lysates (20 μg/lane) were subjected to SDS-PAGE, and the separated proteins were transferred onto a polyvinylidene difluoride membrane (Millipore, Bedford, MA) as we previously described (24). After a 1-h blocking period in TBST containing 5% milk, the membranes were incubated overnight in TBST/5% BSA at 4°C with one of the following rabbit polyclonal Abs purchased from New England Biolabs: phospho-ERK1/ERK2 (Thr202/Tyr204), ERK1/ERK2, phospho-MAPK kinase (MEK)1/2 (Ser217/221), MEK1/2, phospho-CREB (Ser133), and CREB. Proteins were then detected with an anti-rabbit HRP-conjugated goat Ab (Affini-pure; Jackson ImmunoResearch Laboratories, West Grove, PA) and subsequent visualization by ECL (ECL Western blotting detection system; Amersham, Arlington Heights, IL). Given that chemokine expression is regulated primarily at the gene transcription level (18) and because it has been suggested that Mφ constitute a potential source of chemokines in response to oxidative stress (3), we investigated the direct effect of H2O2 on chemokine mRNA induction in the murine Mφ cell line B10R. At first, cells were stimulated for 2 h with increasing doses of H2O2 (100–750 μM), and chemokine mRNA levels were monitored by RPA. As shown in Fig. 1⇓A, we detected a significant and dose-dependent increase of chemokine mRNA expression over negative control for MIP-1β (10-fold), MIP-1α (3-fold), MIP-2 (20-fold), and MCP-1 (4-fold) when maximal H2O2 concentrations were added. In addition, kinetic analyses were performed to determine the incubation time needed to obtain maximal chemokine modulation with an intermediate dose of H2O2 (500 μM). As depicted in Fig. 1⇓B, increased chemokine mRNA levels were detected very rapidly (1 h poststimulation), were maximal after 2 h, and transiently decreased over an 8-h period. Subsequent experiments were thus conducted, stimulating cells for 2 h with 500 μM H2O2. Dose-response and kinetic analyses of H2O2-inducible chemokine mRNA up-regulation in murine Mφ. Cells were treated with either increasing doses of H2O2 (100–750 μM) for 2 h (A) or 500 μM of H2O2 over an 8-h period (B) and chemokine mRNA expression was monitored by using a mCK5 multiprobe RPA system (left panels). Densitometric quantification of chemokine mRNA levels over negative control after normalization to GAPDH (right panels). Results are representative of one of three independent experiments. Having demonstrated that H2O2 was a potent chemokine inducer in Mφ, we were next interested in determining which second messengers were involved in this cellular regulation. Previous studies have suggested the implication of the ERK pathway in chemokine induction in response to proinflammatory stimuli (30); however, activation of ERK1/ERK2 in response to H2O2 has not been reported yet in Mφ. As illustrated in Fig. 2⇓, following cell stimulation with H2O2, we observed a rapid and transient phosphorylation of MEK1/2 (Fig. 2⇓A) and of ERK1/ERK2 (Fig. 2⇓B). Thereafter, to investigate the involvement of the ERK pathway on the H2O2-mediated Mφ chemokine mRNA induction, cells were treated with increasing doses of specific inhibitors directed against either MEK1/2 (PD 98059) or ERK1/ERK2 (Apigenin) before H2O2 stimulation. As depicted in Fig. 3⇓A, low doses of PD 98059 (5 μM) caused a considerable decrease of chemokine induction (∼35% for MIP-1β, ∼45% for MIP-1α, ∼30% for MIP-2, and ∼25% for MCP-1), whereas doses of 10–20 μM totally inhibited the mRNA expression of all four chemokines. In correlation with these observations, cells incubated with intermediate doses of Apigenin (10 μM) showed a marked reduction of their chemokine transcripts (Fig. 3⇓B) (∼55% for MIP-1β, ∼45% for MIP-1α, and ∼80% for MIP-2 and MCP-1), whereas maximal inhibitor concentrations (40 μM) completely abrogated mRNA expression. Altogether, this set of experiments suggests that the ERK pathway seems to play an important role in the H2O2-mediated Mφ chemokine modulation. 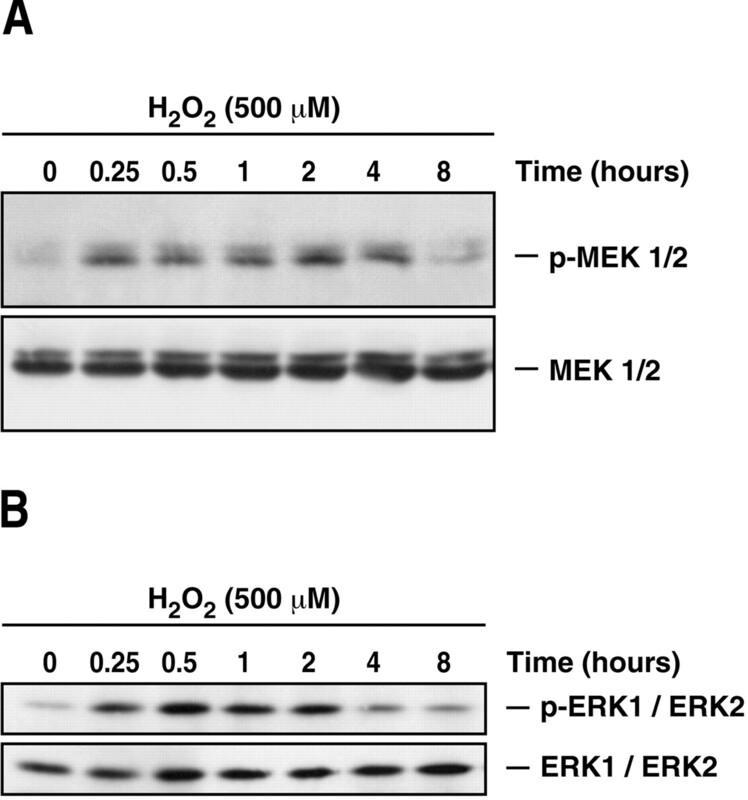 Time course of H2O2-mediated MEK1/2 and ERK1/ERK2 phosphorylation. 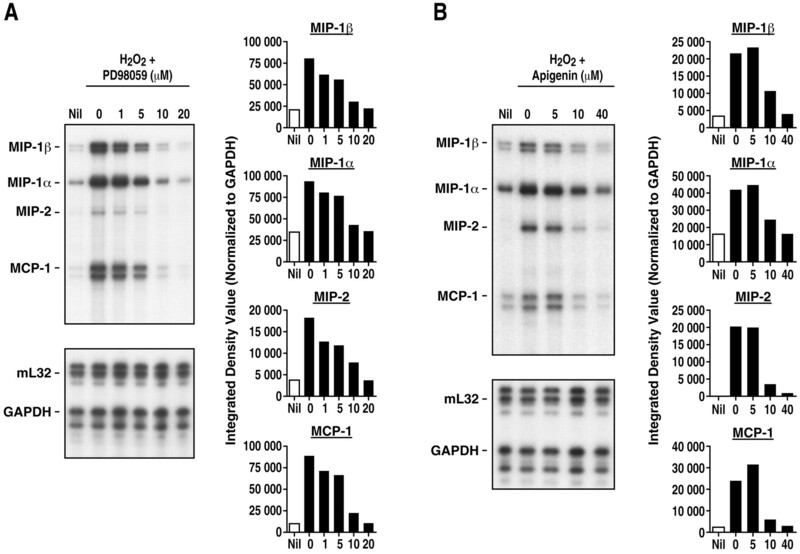 Protein lysates from H2O2-stimulated Mφ over an 8-h period were subjected to Western blotting, and MEK1/2 (A) and ERK1/ERK2 (B) phosphorylation status was revealed using phospho-MEK1/2 and phospho-ERK1/ERK2 Abs. Equal protein levels were verified by using MEK1/2 and ERK1/ERK2 Abs. Results are representative of one of three separate experiments. Effect of specific inhibitors of the ERK pathway on H2O2-dependent chemokine mRNA induction. Cells were treated (1 h) with either PD 98059 (A) or Apigenin (B) before H2O2-stimulation (2 h) and their effect on chemokine induction was evaluated by RPA (left panels). Integrated density values of chemokine mRNA levels normalized to GAPDH (right panels). Results are representative of one of three independent experiments. Nil: untreated (□), H2O2 ± PD 98059 or Apigenin (▪). It is well documented that H2O2 appears to be a physiological activator of the transcription factor NF-κB in a variety of cells including murine Mφ (16). However, in Mφ, this activation has been linked only to H2O2-mediated rat MIP-2 transcription (9). Based on these observations, we initially evaluated whether this NF was activated in H2O2-stimulated B10R Mφ. As shown in Fig. 4⇓A, NF-κB nuclear translocation was already increased 30 min following H2O2 treatment and was maximal 2 h poststimulation. To define the nature of the H2O2-induced NF-κB complex, supershift assays were performed using Abs directed toward p50 and p65, two ubiquitous members of the NF-κB family. As illustrated in Fig. 4⇓B, the complex binding was diminished and partially supershifted by the anti-p50 Ab and almost completely abrogated by the anti-p65 Ab. These data indicate that H2O2 activates the DNA binding of both p50 and p65 NF-κB subunits in murine Mφ. To address the question whether H2O2 was not only leading to NF-κB nuclear translocation but also to its binding to one or more chemokine genes, nuclear extracts from H2O2-treated cells were incubated with specific oligonucleotides containing the NF-κB binding sites present in the murine MIP-1α, MIP-2, and MCP-1 promoters. Interestingly, we observed that H2O2 stimulation led to the binding of NF-κB to all chemokine genes examined (Fig. 4⇓C). H2O2 induces NF-κB nuclear translocation and binding to several chemokine promoters in murine Mφ. A, Nuclear extracts from cells either left untreated or stimulated with H2O2 for different time periods (0–8 h) were incubated with a γ-32P-labeled NF-κB probe and were subjected to EMSA. Binding specificity was tested by adding to nuclear extracts from 2-h-treated cells a 100-fold molar excess of cold NF-κB oligonucleotide. B, For supershift assays, nuclear extracts from cells treated with H2O2 (2 h) were incubated or not with specific Abs against the p50 and p65 NF-κB isoforms for 1 h before EMSA. C, EMSA analysis was performed as described in A, but this time nuclear extracts were incubated with one of three NF-κB probes specific for the murine MIP-1α, MIP-2, or MCP-1 promoters. Binding specificity was tested by adding to nuclear extracts from 2-h-treated cells a 100-fold molar excess of either a cold NF-κB/MIP-1α, MIP-2, or MCP-1 oligonucleotide or a nonspecific Sp1 probe. These results are representative of one of three separate experiments. Having found that H2O2 was able to increase NF-κB capacity to bind several chemokine promoters, we were interested in further evaluating the potential role of this transcription factor in the H2O2-mediated chemokine regulation. Because we have demonstrated that specific inhibitors of the ERK pathway abolish chemokine expression in response to H2O2, we examined the effect of these compounds on the H2O2-induced NF-κB binding activity. As illustrated in Fig. 5⇓A, when cells were treated with either Apigenin or PD 98059, the H2O2-enhanced nuclear translocation of NF-κB decreased in a dose-dependent manner. These data suggest that abrogation of chemokine transcription by MEK1/2 and ERK1/ERK2 inhibitors may involve a down-regulation of NF-κB. To more directly address the putative contribution of NF-κB on chemokine modulation by H2O2, Mφ were treated for 1 h with increasing doses of BAY 11-7082 (1, 3, and 5 μM), a chemical compound which has been shown to decrease NF-κB expression by inhibiting IκBα phosphorylation (31). Cells were stimulated further with H2O2 (2 h), and NF-κB nuclear translocation was monitored by EMSA (Fig. 5⇓B). As expected, cells incubated with BAY 11-7082 showed a significant and dose-dependent reduction in the binding of the NF-κB complex in response to H2O2. Based on these data, we examined the effect of this IκBα inhibitor on the H2O2-mediated chemokine modulation. To this end, following cell stimulation as described in the previous experiment, total RNA was extracted and subjected to RPA analysis (Fig. 5⇓C). When Mφ were treated with BAY 11-7082 at a dose of 5 μM, we detected a strong down-modulation of MIP-1β transcript (∼70% inhibition), a partial decrease of MIP-1α (∼40% inhibition), a more dramatic reduction of MCP-1 (∼80% inhibition), and a total inhibitory effect over the MIP-2 transcript. 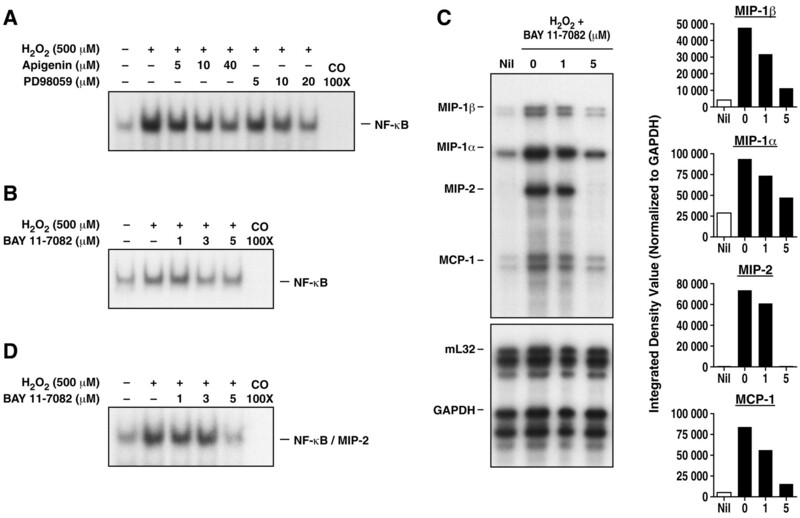 These observations strongly suggest that NF-κB is involved in H2O2-dependent up-regulation of all these chemokine transcripts, and seems to be essential for MIP-2 induction. To confirm this hypothesis, we evaluated the effect ofBAY 11-7082 on the H2O2-dependent NF-κB capacity to bind the murine MIP-2 promoter. As shown in Fig. 5⇓D, a maximal concentration of the IκBα inhibitor completely blocked the binding of NF-κB to the MIP-2 promoter in response to H2O2. Role of NF-κB on Mφ chemokine mRNA expression in response to H2O2. Nuclear extracts from either untreated or H2O2-stimulated cells (2 h) pretreated or not with Apigenin or PD 98059 (1 h) were incubated with a labeled NF-κB oligonucleotide and subjected to EMSA (A). 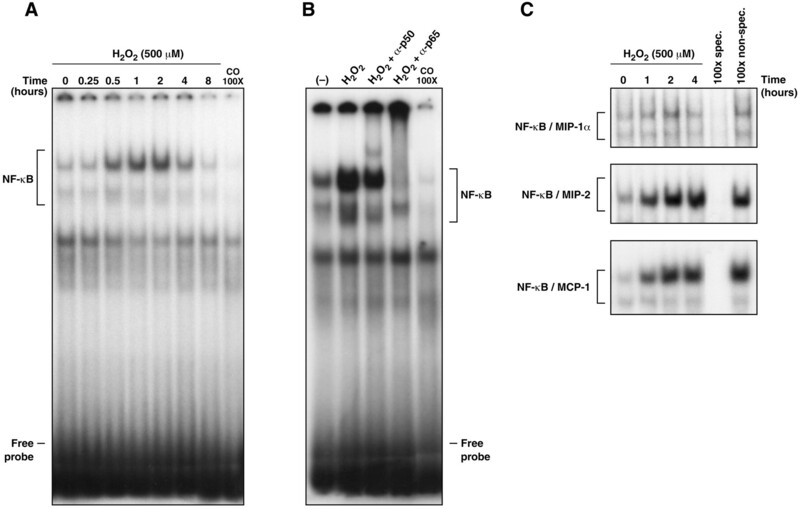 Either a consensus NF-κB probe (B) or a probe containing a NF-κB binding site in the murine MIP-2 promoter (D) were incubated with nuclear proteins from cells treated with BAY 11-7082 (1 h) before H2O2 stimulation (2 h), and EMSA were performed. Binding specificity was tested by adding to nuclear extracts from 2-h-treated cells a 100-fold molar excess of cold NF-κB oligonucleotide. Total RNA was extracted from Mφ stimulated, as described in the previous experiment, and chemokine mRNA modulation was monitored by RPA (C). Nil: untreated (□), H2O2 ± BAY 11-7082 (▪). These results are representative of one of three independent experiments. Our previous results indicated that inhibitors of the ERK pathway blocked chemokine mRNA expression but did not completely abolish NF-κB binding activity. Therefore, we investigated whether AP-1, another redox-responsive transcription factor, was also involved in this regulatory process. In fact, H2O2-induced AP-1 nuclear translocation has been reported in a variety of nonphagocytic cells, and this activation has been associated with chemokine gene expression (18, 21, 22). Therefore, we first addressed the question of whether H2O2 led to AP-1 activation in Mφ. As depicted in Fig. 6⇓A, when oligonucleotides containing AP-1 consensus binding sequences were used to probe nuclear extracts from H2O2-treated B10R Mφ, we observed a rapid (detectable 30 min poststimulation) and sustained binding activity of this transcription factor, reaching its maximal expression at 4 h, after which time the signal decreased almost to basal level. In addition, because an AP-1 binding site was identified in the murine MCP-1 gene (28), nuclear extracts from H2O2-treated cells were incubated with a specific oligonucleotide containing such a sequence; however, we did not detect any transcription factor binding activity (data not shown). This could be explained by the fact that this combined AP-1/GC box binding site seems to function as an Sp-1 site and not as an AP-1 site, as it was indicated by supershift assays performed by Ping et al. (28). Therefore, the absence of H2O2-inducible AP-1 binding activity to the murine Mφ MCP-1 gene is not surprising. The similar induction kinetics of AP-1 nuclear translocation and chemokine mRNA expression suggested a possible role for this transcription factor in H2O2-mediated chemokine regulation. To more fully address this question, we next evaluated the involvement of the ERK pathway on the H2O2-dependent AP-1 binding activity. When cells were treated with increasing doses of either Apigenin (Fig. 6⇓B) or PD 98059 (Fig. 6⇓C), nuclear translocation of AP-1 in response to H2O2 was reduced in a dose-dependent manner. Altogether, these results suggest that H2O2-induced chemokine up-regulation in Mφ involves the participation of the ERK pathway as well as the activation of the NF-κB and AP-1 transcription factors. AP-1 nuclear translocation is induced by H2O2 via the ERK pathway in murine Mφ. Labeled AP-1 probe was incubated with nuclear extracts from cells either nonstimulated or treated with H2O2 for different time periods (0–8 h) and EMSA analysis was performed (A). 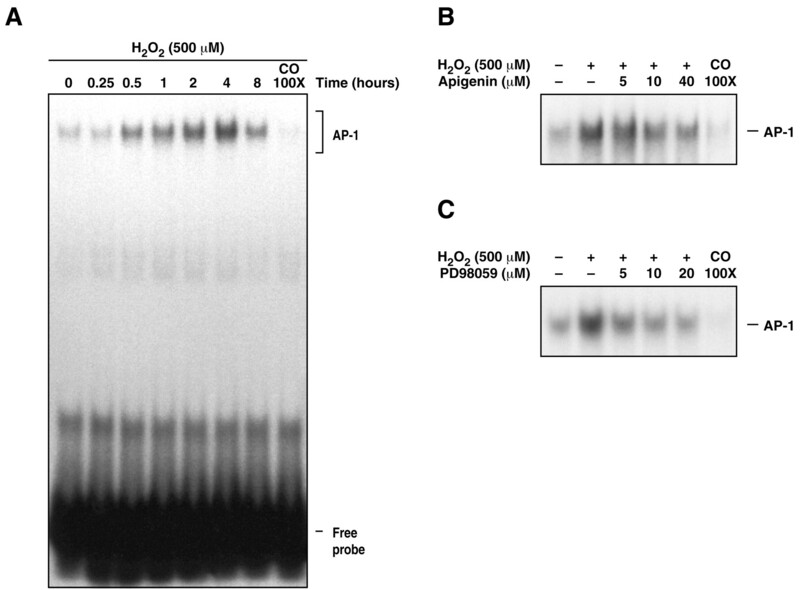 Nuclear proteins from H2O2-stimulated cells pretreated or not with Apigenin (B) or PD 98059 (C) were subjected to EMSA following incubation with an AP-1 consensus probe. Binding specificity was tested by adding to nuclear extracts from 4-h-treated cells a 100-fold molar excess of cold AP-1 oligonucleotide. These results are representative of one of three separate experiments. In addition to evaluating the potential role of NF-κB and AP-1, we investigated the possible implication of CREB on the H2O2-mediated chemokine modulation. This transcription factor was reported to be activated by H2O2 in nonphagocytic cells (14, 15), and it has been shown to be important for chemokine regulation (29, 32). Based on these observations, we initially tested the capacity of H2O2 to activate CREB in Mφ. As illustrated in Fig. 7⇓A, 30 min following cell stimulation, we observed a marked phosphorylation of the CREB protein, which decreased very rapidly thereafter. In concert with our results obtained by Western blot, mobility shift assays revealed a rapid H2O2-induced CREB binding activity by incubating nuclear extracts with either a probe containing a consensus binding site for CREB (Fig. 7⇓B) or a specific oligonucleotide containing the CREB binding site present in the murine MIP-1β gene (Fig. 7⇓C). Next, we examined the involvement of the ERK pathway in H2O2-mediated CREB activation. As illustrated in Fig. 8⇓A, both PD 98059 and Apigenin had a down-regulatory effect on the H2O2-enhanced CREB binding activity. These observations led us to more directly investigate the putative contribution of CREB to the H2O2-dependent chemokine modulation. To this end, before H2O2 stimulation, cells were treated for 1 h with increasing doses of MDL-12,330A (1, 5, 10 μM), which prevents cAMP-dependent CREB phosphorylation by inhibiting adenylate cyclase activity (33), and EMSA analysis was performed. As shown in Fig. 8⇓B, H2O2-induced CREB binding activity was decreased in a dose-dependent manner by this compound. We then evaluated the effect of this specific inhibitor on the H2O2-inducible chemokine regulation. As depicted in Fig. 8⇓C, incubation of cells with MDL-12,330A at 10 μM (a concentration that, according to our results, abrogated the H2O2-mediated CREB binding activity) had a total inhibitory effect over all four chemokine transcripts. 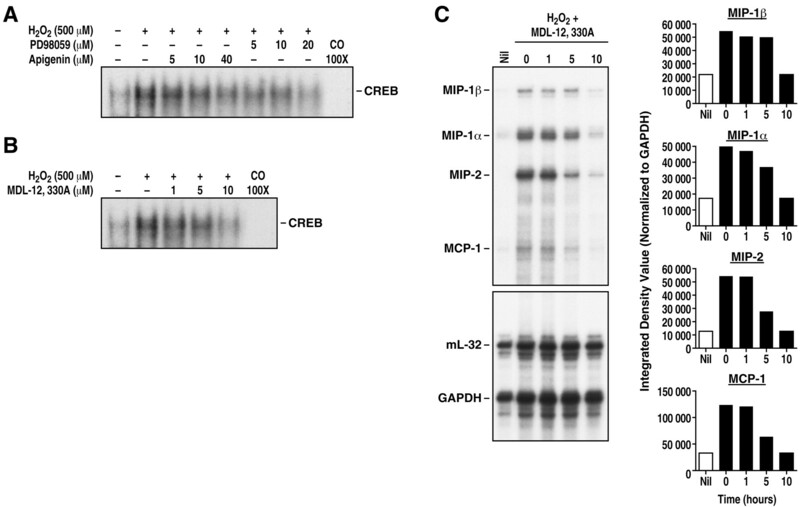 H2O2 induces CREB phosphorylation and binding to the murine MIP-1β promoter in Mφ. 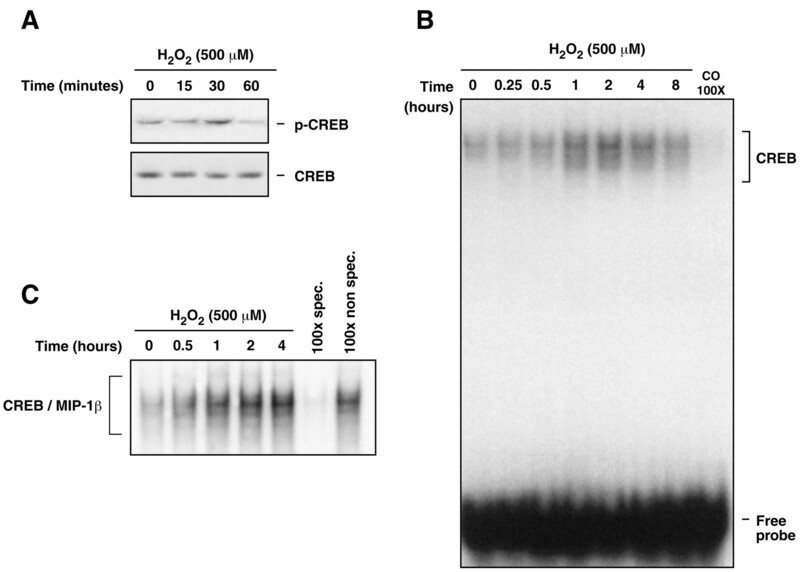 A, Time course of CREB phosphorylation in response to H2O2 (0–60 min) was monitored by Western blot as described in Fig. 2⇑. B, Following incubation with a labeled CREB consensus probe, nuclear proteins from H2O2-stimulated cells (0–8 h) were subjected to EMSA. Binding specificity was tested by adding to nuclear extracts from 2-h-treated cells a 100-fold molar excess of cold CREB oligonucleotide. C, EMSA analysis was performed as described in B, but this time nuclear extracts were incubated with a probe containing the CREB binding site present in the murine MIP-1β gene. Binding specificity was tested by adding to nuclear extracts from 2-h-treated cells a 100-fold molar excess of either a cold CREB/MIP-1β oligonucleotide or a nonspecific Sp1 probe. These results are representative of one of three independent experiments. Effect of MEK1/2, ERK1/ERK2, and cAMP inhibitors on H2O2-dependent CREB activation and chemokine modulation. Nuclear extracts from either untreated or H2O2-stimulated cells (2 h) pretreated or not with Apigenin or PD 98059 (1 h) were incubated with a labeled CREB oligonucleotide and subjected to EMSA (A). Following MDL-12,330A treatment (1 h) and H2O2 stimulation (2 h), either nuclear proteins or total RNA was extracted. Next, CREB binding activity (B) and chemokine mRNA modulation (C) were monitored by EMSA and RPA, respectively. Nil: untreated (□), H2O2 ± MDL-12,330A (▪). Results are representative of one of three separate experiments. Our previous results clearly indicated that H2O2 was able to induce nuclear translocation of three different transcription factors (NF-κB, AP-1, and CREB), and suggested a potential role for all of them on the H2O2-dependent activation of Mφ chemokine genes. In addition, the cooperative action among different transcription factors, such as NF-κB and AP-1, has been suggested to be involved in the expression of several chemokines (34, 35). This previous evidence along with our data prompted us to address the question of whether NF-κB, AP-1, and CREB were acting in concert through complex formation, which could in turn lead to the observed chemokine gene up-regulation. To this end, nuclear proteins extracted from H2O2-stimulated cells were incubated with the radiolabeled NF-κB probe, either in the absence or in the presence of a 100-fold molar excess of one of three cold oligonucleotides containing binding sites for either NF-κB, AP-1, or CREB (Fig. 9⇓A). As expected, H2O2-induced NF-κB complex binding was completely abrogated in the presence of a 100-fold molar excess of cold NF-κB oligonucleotide. Of interest, NF-κB complex binding was strongly reduced in the presence of a 100-fold molar excess of either cold AP-1 or CREB oligonucleotides. We next performed the same kind of experiment as described above, while incubating nuclear extracts in presence of either the radiolabeled AP-1 (Fig. 9⇓B) or CREB (Fig. 9⇓C) probes. As it was observed for NF-κB, both the H2O2-enhanced AP-1 and CREB binding activities were abolished in presence of a 100-fold molar excess of their respective specific cold oligonucleotides, and were markedly diminished when one of the specific oligonucleotides for the other two transcription factors were added in a 100-fold molar excess. To further address the question whether H2O2 was able to induce transcription factor complex formation, supershift assays were performed by incubating nuclear extracts from H2O2-treated cells with specific Abs against some of the main members of the NF-κB (p50 and p65), AP-1 (c-Fos, Jun B, and c-Jun), and CREB (CREB-1) families before reaction with either NF-κB, AP-1, or CREB labeled probes. As shown in Fig. 10⇓, we detected a significant decrease of NF-κB and AP-1 binding activities in the presence of all Abs. In the case of CREB, its DNA binding activity was reduced following incubation with Abs against JunB, p50, or p65, and a partial supershift was observed in presence of CREB-1 Ab. In contrast, when either an Sp1 Ab or an Sp1 cold oligonucleotide (100× nonspecific competition) were added, no changes in the binding of NF-κB, AP-1, or CREB were detected, confirming the specificity of our previous observations. Altogether, these results allow us to suggest that H2O2 leads to the formation of a transcriptional complex involving NF-κB, AP-1, and CREB, which in turn seems to be necessary for maximal modulation of various Mφ chemokine genes. H2O2-induced AP-1, CREB, and NF-κB complex formation in murine Mφ. 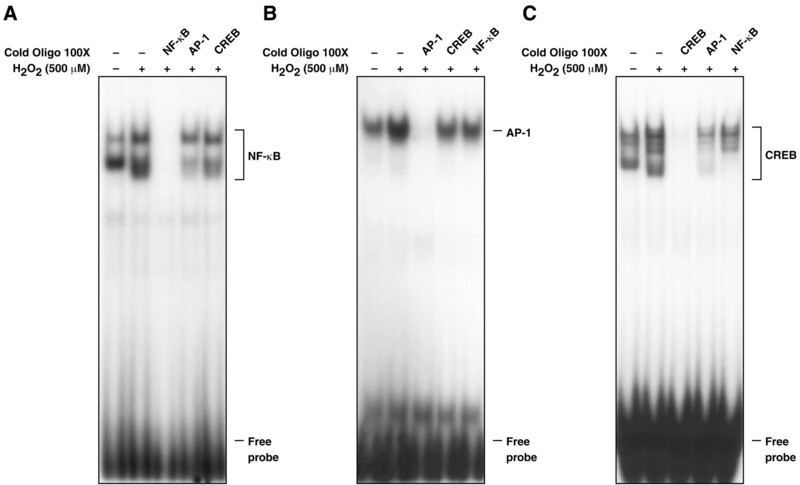 Nuclear proteins from H2O2-stimulated cells were incubated with the radiolabeled NF-κB probe, either in the absence or in the presence of a 100-fold molar excess of one of three cold oligonucleotides containing binding sites for either NF-κB, AP-1, or CREB (A). The same experiment was performed as described above, but this time nuclear extracts were incubated in presence of the radiolabeled AP-1 (B) or CREB (C) consensus probes. These results are representative of one of three independent experiments. 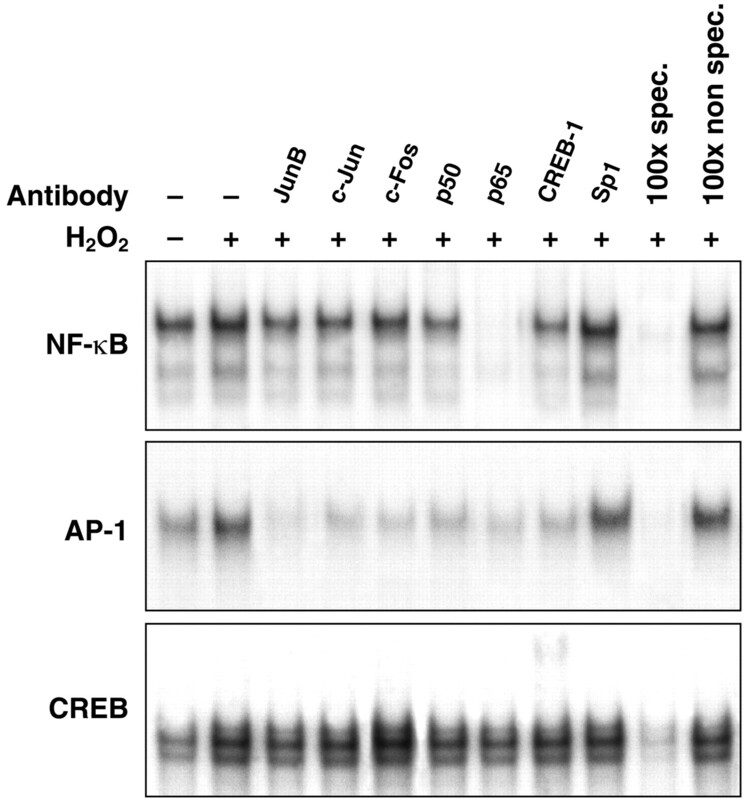 Abs against various NF-κB, AP-1, and CREB family members lead to changes on H2O2-induced NF-κB, AP-1, and CREB binding activities in Mφ. Supershift assays were performed by incubating nuclear proteins from H2O2-treated cells with specific Abs against Jun B, c-Jun, c-Fos, p50, p65, CREB-1, or Sp1 for 1 h at 4°C before reaction with a NF-κB, AP-1, or CREB labeled probe. Binding specificity was tested by adding to nuclear extracts from H2O2-treated cells a 100-fold molar excess of either a cold NF-κB, AP-1, or CREB oligonucleotide or a nonspecific Sp1 probe. These results are representative of one of three independent experiments. Increased levels of mRNA may be the result of transcriptional and/or posttranscriptional mechanisms of regulation. To establish through which of them H2O2 leads to an increase of Mφ chemokine mRNA expression, we performed commonly used transcriptional inhibitor actinomycin D assays as previously described (8). At first, B10R cells were stimulated with H2O2 for 2 h either in the absence or in the presence of actinomycin D (5 μg/ml), and chemokine mRNA levels were monitored by RPA. As shown in Fig. 11⇓A, cotreatment with actinomycin D completely blocked the expression of all four chemokine transcripts, suggesting that H2O2-dependent chemokine up-regulation is at least in part transcriptionally regulated. Next, the contribution of changes in mRNA stability to chemokine induction by H2O2 was evaluated by measuring chemokine mRNA t1/2. As depicted in Fig. 11⇓B, in the presence of actinomycin D, chemokine mRNA from nonstimulated cells (control) decayed rapidly with a t1/2 of ∼30 min for MIP-1β and MIP-2, and 2 h for MIP-1α and MCP-1. H2O2 treatment significantly increased the t1/2 of MIP-1α, MIP-2 and MCP-1 mRNA, with a t1/2 >4 h, indicating posttranscriptional stabilization. In contrast, H2O2 did not lead to an enhancement of MIP-1β t1/2. Altogether, these results suggest that the induction of MIP-1β mRNA by H2O2 results from transcriptional regulation, whereas that of MIP-1α, MIP-2, and MCP-1 is due to both transcriptional activation of their genes and posttranscriptional stabilization of their mRNA transcripts. Transcriptional and posttranscriptional regulation of Mφ chemokines by H2O2. A, B10R cells were stimulated with H2O2 for 2 h either in the absence or in the presence of actinomycin D (AD; 5 μg/ml). Next, total RNA was extracted and chemokine mRNA levels were monitored by RPA (left panel). Densitometric quantification of chemokine mRNA induction over negative control after normalization to GAPDH (right panel). B, Cells were left untreated (control) or stimulated with H2O2 for 2 h. Then, actinomycin D was added for different time periods (0–4 h). Following total RNA isolation, RPA analysis was performed (left panel). Densitometric quantification of the decay of chemokine mRNA normalized to GAPDH (right panel). H2O2, ♦; control, □. Results are representative of one of three independent experiments. Chemokines are critical protein factors responsible for the activation and recruitment of specific leukocyte subsets to the sites of inflammation, and ROS have been identified as important regulators of their expression (3, 4). Because Mφ represent an important population modulating the inflammatory response, they are likely to be a potential target for oxidative stress, which would in turn trigger chemokine synthesis. In fact, it has been reported that ROS-generating enzymes lead to MCP-1 production by peritoneal rat Mφ (36), and increased MIP-1α and MIP-2 mRNA levels have been detected in H2O2-stimulated rat alveolar Mφ (3, 8, 9). In agreement with these previous findings, we observed that H2O2 increases mRNA expression of several chemokines (MIP-1α, MIP-1β, MIP-2, and MCP-1) in murine B10R Mφ in time- and dose-dependent manners. Moreover, our data obtained from both transcriptional inhibition and RNA decay assays suggest that the observed increase of steady-state Mφ chemokine mRNA levels in response to H2O2 is the result of a regulatory mechanism mediated by transcriptional activation for MIP-1β, and by both chemokine gene transcription activation and posttranscriptional mRNA stabilization for MIP-1α, MIP-2, and MCP-1. Our results confirm and extend those reported by Shi and colleagues who found in rat alveolar Mφ that H2O2-induction of MIP-1α (8) and MIP-2 (9) mRNA implicated a role for both transcriptional and posttranscriptional control. This dual mechanism of regulation could be explained by the capacity of ROS to control either active transcription factors or redox-sensitive proteins. Oxidant-induced conformational changes of regulatory proteins may, in turn, influence a spectrum of genes by initiating transcription and/or stabilizing specific RNAs (8). Different lines of evidence suggest that a potential regulatory mechanism responsible for the observed H2O2-mediated increase of murine MIP-1α, MIP-2, and MCP-1 mRNA stability could be associated with the presence of AU-rich motifs in the 3′ -untranslated regions of their mRNAs, which have been implicated in mRNA destabilization (37). In fact, AU-rich sequences were identified for murine and rat MIP-1α (27, 38), human and rat MCP-1 (39, 40), and rat MIP-2 (9). 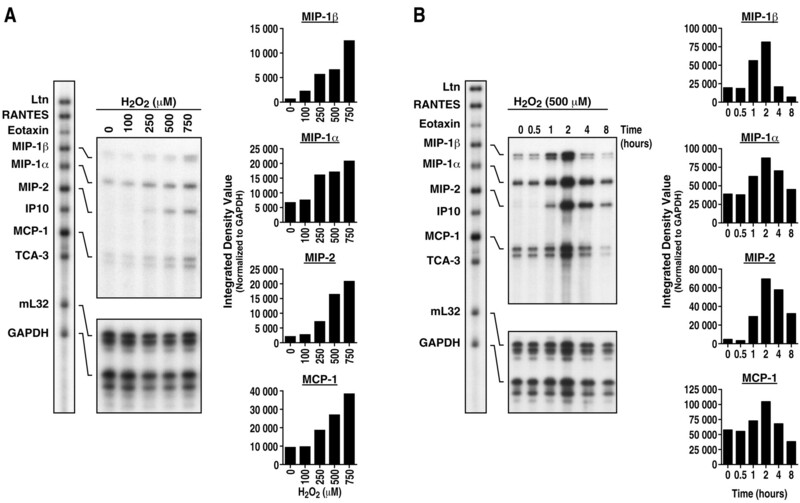 Of interest, it was previously postulated that increased mRNA stabilization of rat MIP-1α (8) and MIP-2 (9) in response to H2O2, and of human MCP-1 by hyperoxia (39) might be due to the binding of the redox-sensitive protein adenosine-uridine-binding factor to such AU-rich motifs, to form exceptionally stable complexes and thus increase mRNA stability (41). Some variants of AU-rich elements have also been found in the murine MIP-1β gene (27); however, in contrast to what we observed for MIP-1α, we did not detect any H2O2-inducible MIP-1β mRNA stability, and this is in line with the lack of reports showing stimulus-enhanced mRNA stability for this chemokine. Even though the molecular events underlying differential regulation of MIP-1β and MIP-1α mRNA stability deserve further investigation, the fact that these two chemokines exhibit antagonistic activities in certain biological situations (42) suggests that their expression could be modulated in opposite ways. Although the current data provide evidence that H2O2 can function as a signaling molecule to activate gene expression, the transductional mechanisms underlying chemokine regulation by this ROS remain largely unexplored. Thus, in the present study, we have investigated the link between H2O2-induced Mφ chemokine mRNA expression and the activation of several signaling pathways (ERK and cAMP) and transcription factors (NF-κB, AP-1, and CREB), which have been identified previously as targets for oxidative stress in various experimental contexts. ERK1/ERK2 MAPK have been shown to be activated by H2O2 in a variety of nonphagocytic cells (12, 14, 43, 44), and, in Mφ, this has been suggested indirectly by exposing cells to hyperoxia (45) or to oxidant-generating agents (46). In concert with these findings, we provide direct evidence showing that H2O2 strongly induces phosphorylation of ERK1/ERK2 as well as of their immediate upstream activator, MEK1/2 in Mφ. Even though the precise targets through which H2O2 activates the ERK pathway remain to be established, a possible mechanism could be intracellular tyrosine phosphatase inhibition, because these proteins show redox-sensitive cysteine residues in their active sites (47), and previous studies have demonstrated that exogenously added H2O2 could transiently and reversibly inactivate phosphatase activity (10). Alternatively, it is also plausible that H2O2-mediated ERK activation may involve a Ras-dependent mechanism. In fact, recent observations have demonstrated that Ras is an important sensor of oxidative stress (48), and MAPK are known to be activated downstream of Ras (49). Further studies are required to shed light on this matter. Several reports have linked the ERK pathway to chemokine induction by several proinflammatory stimuli (30). In response to oxidative stress, this has only been suggested indirectly by showing that angiotensin II-mediated MCP-1 induction could be inhibited by blocking either H2O2 generation or MEK1/2 activation (50). Extending these previous observations, our data clearly show that blockage of the ERK pathway at two different levels of the signaling cascade (MEK1/2 and ERK1/ERK2) completely abolished the H2O2-mediated Mφ chemokine mRNA expression. These results are consistent with an ERK-dependent signaling mechanism of chemokine regulation by oxidative stress. The NF-κB transcription factor plays important roles in immune and stress responses, and H2O2 has been shown to act as an effective inducer of its activity (17). Although we and others have demonstrated that H2O2 is able to induce Mφ NF-κB activation, the upstream processes leading to this cellular regulation have not yet been clearly elucidated. PKC and intracellular calcium were identified as targets of H2O2; however, further studies indicated that neither of them was involved in the H2O2-inducible Mφ NF-κB activation (51). Analysis of possible alternative second messengers revealed to us that blockage of the ERK pathway considerably reduced the H2O2-dependent Mφ NF-κB nuclear translocation. In contrast to our findings, Janssen-Heininger et al. (44) reported that these MAPK seem to act as negative regulators of NF-κB in H2O2-treated epithelial cells. A possible explanation for this discrepancy may lie in the fact that cells are generally subjected to a redox regulation, pro-oxidant in the cytosol and reductant in the nucleus (52), and because the equilibrium between oxidants and antioxidants within these compartments may be cell-type specific (43), the same signaling pathway may act in opposite ways in different cells. In this context, we propose a novel mechanism for positive regulation of H2O2-inducible NF-κB activation through the ERK pathway. Even though our results suggest an important role for ERK1/ERK2 in the H2O2-dependent Mφ NF-κB activation, it needs to be determined whether they act directly or via intermediate kinases. Moreover, because we did not detect total abrogation of NF-κB activation by using specific inhibitors against these MAPKs, it is possible that other kinases, such as the IκB kinase complex, which is also activated by H2O2 (53), could also contribute to this regulation. In addition to NF-κB, we observed that H2O2 was also able to increase the DNA binding activity of another redox-sensitive factor, AP-1. Our results further indicated that the H2O2-dependent AP-1 nuclear translocation, as well as that of NF-κB, seems to be under the control of the ERK pathway. These data, together with previous reports showing that, in response to proinflammatory stimuli, both NF-κB and AP-1 activation and chemokine induction can be attenuated by blocking the ERK cascade (30, 54), allow us to suggest that H2O2 may induce Mφ chemokine expression, at least in part, by activating NF-κB and AP-1 via ERK-dependent pathways. Whether NF-κB and AP-1 contribute to this cellular regulation directly by binding to the chemokine promoters and/or by interacting with each other remains to be confirmed; however, different lines of evidence seem to support both possibilities. On the one hand, NF-κB binding sites were reported for the murine MCP-1 (28), MIP-1α (26), and MIP-2 (27) promoters. Even though no NF-κB binding sites have been identified in the murine MIP-1β promoter, studies performed with p50-deficient mice indicate that NF-κB is required for MIP-1β production (55). In response to H2O2, AP-1 was found to bind to the human MCP-1 (21) and IL-8 (22) genes in endothelial and epithelial cells, respectively. Similarly, NF-κB was shown to bind to the MIP-2 promoter in rat alveolar Mφ following H2O2 treatment (9), and in accordance with this finding, our EMSA analysis revealed that NF-κB was able to bind to the murine Mφ MIP-1α, MIP-2, and MCP-1 promoters in response to H2O2. In contrast, physical and functional interactions between AP-1 and NF-κB have been reported (56) and maximal induction of several chemokine promoters has been shown to be dependent on the cooperative interaction between these two NF (35). In agreement with these published data, we detected a strong decrease on both H2O2-dependent NF-κB and AP-1 DNA binding activities by reciprocal competition for these binding sites. In addition, supershift assays revealed significant reduction in H2O2-inducible NF-κB and AP-1 binding activities in the presence of specific Abs against some of the main members of both transcription factor families (p50, p65, JunB, c-Jun, and c-Fos), further suggesting the formation of NF complexes in response to this ROS. Analysis of possible alternative second messengers for H2O2-mediated Mφ chemokine induction indicated the potential involvement of cAMP-dependent pathways. Even though the exact mechanisms by which cAMP may contribute to this regulation are not completely understood, based on our results and those presented by others, a potential role for cAMP-dependent CREB activation via the ERK pathway can be proposed. We observed that both the H2O2-mediated chemokine induction and CREB binding activity were down-regulated by specific inhibitors of both the ERK and cAMP pathways. In agreement with our observations, Lee et al. (57) recently showed that cAMP potentiates H2O2-induced ERK phosphorylation, and others (14) have reported the involvement of the ERK pathway in CREB phosphorylation by H2O2. Moreover, because increases of cAMP-dependent CREB phosphorylation can occur in the absence of ERK activation (58), it is also possible that the noticed CREB phosphorylation in H2O2-treated Mφ may be due to the activation of other cAMP-dependent pathways different from ERK1/ERK2, such as the protein kinase A cascade. Alternatively, in addition to activating CREB, cAMP could also contribute to the observed H2O2-mediated increase of mRNA chemokine levels by up-regulating other transcription factors such as AP-1, via the cAMP response element-dependent transcription of the immediate early gene, c-fos (59), and/or NF-κB and AP-1 via the ERK pathway. Functional binding sites for CREB have been identified only in the murine MIP-1β (29) and RANTES (32) promoters. In line with these findings, we showed that CREB was able to bind to the murine MIP-1β promoter in H2O2-treated Mφ, suggesting a direct contribution for this NF to MIP-1β gene activation by H2O2. However, it is possible that CREB also contributes to the H2O2-inducible MIP-1α, MIP-2, and MCP-1 mRNA up-regulation by interacting with other transcription factors, such as NF-κB and AP-1. In fact, our EMSA experiments revealed that the H2O2-dependent CREB DNA binding activity was dramatically reduced in the presence of an excess of cold AP-1 or NF-κB oligonucleotides. Likewise, both NF-κB/DNA and AP-1/DNA complexes were strongly diminished when a cold CREB probe was added in excess. Supporting these observations, a significant decrease of CREB binding activity was detected when specific Abs against NF-κB (p50, p65) or AP-1 (JunB) families were added. Similarly, both NF-κB/DNA and AP-1/DNA complexes were strongly reduced in the presence of a CREB-1 Ab, suggesting the formation of NF complexes. This is in agreement with reports showing functional interactions between NF-κB and CREB family members (60) and with others who have described the formation of dimers between members of the AP-1 and CREB families (61). Based on our results and taking into account the physical interactions reported between the NF studied as well as their binding sites identified in the murine chemokine promoters, we propose a hypothetical model for Mφ chemokine transcriptional activation in response to H2O2, which involves the formation of a multiprotein NF complex necessary for maximal chemokine up-regulation (Fig. 12⇓). Hypothetical model of H2O2-mediated chemokine transcriptional activation in murine Mφ. 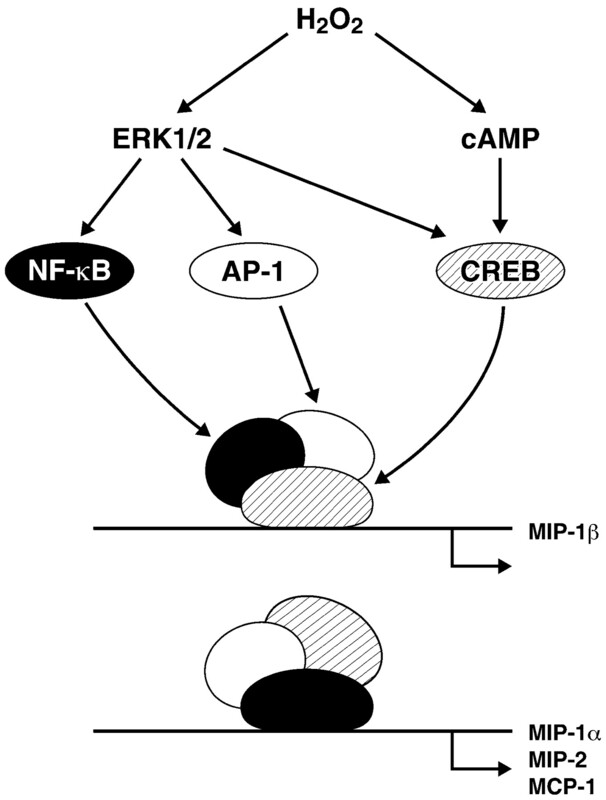 Following cell exposure to H2O2, ERK- and cAMP-dependent signaling pathways are activated, leading to the nuclear translocation and DNA binding of NF-κB, AP-1, and CREB. These transcription factors seem to form a multiprotein complex that might adapt its spatial conformation to bind to the available specific binding sites present in the murine MIP-1β, MIP-1α, MIP-2, and MCP-1 promoters and in such a way lead to maximal Mφ chemokine transcription activation. Even though the exact mechanisms through which this H2O2-inducible transcriptional factor complex might be affecting chemokine gene transcription require further investigation, a synergistic effect could be a plausible explanation. In fact, multiprotein complex formation has been shown to be essential for synergistic murine gene activation (62). Moreover, different lines of evidence suggest that synergistic gene activation could be attributed to either physical NF interactions, as in the case of NF-κB/AP-1 dimers (56), or the enhancing effect of one NF on the transcription activity of the other, as previously described for members of the AP-1 family (63). In addition, because NF-κB-, CREB-, and AP-1-dependent transcriptional activation has been found to be enhanced or to require coactivators such as non-DNA binding CREB-binding protein and CCAAT/enhancer binding protein (62, 64, 65), it is conceivable that one or more of such transcriptional cointegrators is present in the H2O2-induced multiprotein complex. Many protein/protein/DNA interactions and a more detailed understanding of the specific roles of the various transcription factors involved need to be clarified to fully characterize Mφ chemokine gene regulation by H2O2. Moreover, because increased mRNA levels have been detected for various Mφ chemokines in response to one stimulus, including pathogens such as bacteria (66) and protozoa (67), as well as proinflammatory inert crystals (e.g., Plasmodium falciparum hemozoin and monosodic urea crystals) (M. Jaramillo and M. Olivier, unpublished data), it is plausible to think that the induction of multiple signaling pathways leading to the formation of a multiprotein transcriptional factor complex could be a more generalized mechanism found in nature necessary for optimal and simultaneous multiple chemokine transcription activation. In conclusion, our findings allow us to propose a multistep and multifactor mechanism for H2O2-mediated chemokine regulation in murine Mφ, which seems to involve transcriptional and posttranscriptional control and to require the cooperation between ERK- and cAMP-dependent pathways leading to the formation of an essential transcriptional complex (NF-κB, AP-1, and CREB) for maximal and fine tuning of chemokine gene expression. Given the important link between oxidant production and human disease, our work may contribute to the delineation of the signaling pathways regulated by H2O2, which might be essential in the control of diverse cellular events associated with inflammatory conditions. We thank Marc Bergeron for his careful editing of the manuscript. ↵1 This work was supported by grants from the Canadian Institutes in Health Research to M.O. M.O. is member of a Canadian Institutes in Health Research Group in Host-Pathogen Interactions. M.O. is a recipient of a Canadian Institutes in Health Research Investigator Award and is a Burroughs Wellcome Fund Awardee in Molecular Parasitology. M.J. is a recipient of a Ministère de l’Éducation du Québec PhD studentship. ↵3 Abbreviations used in this paper: ROS, reactive oxygen species; MCP-1, monocyte chemoattractant protein-1; Mφ, macrophage; MIP, Mφ-inflammatory protein; ERK, extracellular signal-regulated kinase; MAPK, mitogen-activated protein kinase; MEK, MAPK kinase; CCL, CC chemokine ligand; PKC, protein kinase C; redox, reduction-oxidation; RPA, RNase protection assay. Driscoll, K. E. 2000. TNF-α and MIP-2: role in particle-induced inflammation and regulation by oxidative stress. Toxicol. Lett. 112–113:177.